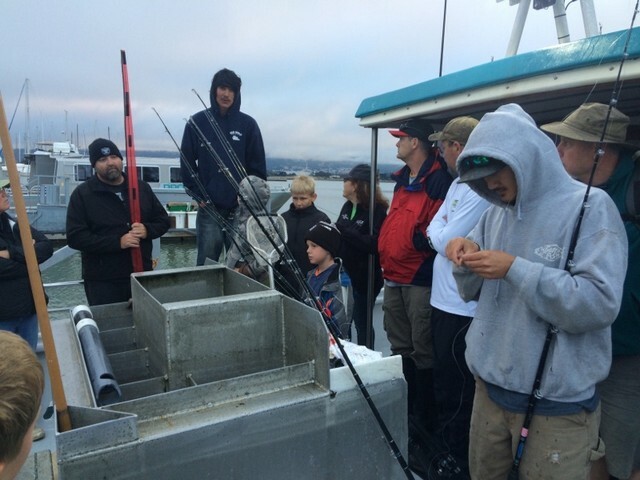 On July 9th, a group of Cub Scouts from Fair Oaks Pack 215 boarded the Sea Wolf with aspirations of fishing the San Francisco Bay for striped bass, bottom fish, halibut and maybe a shark or two. 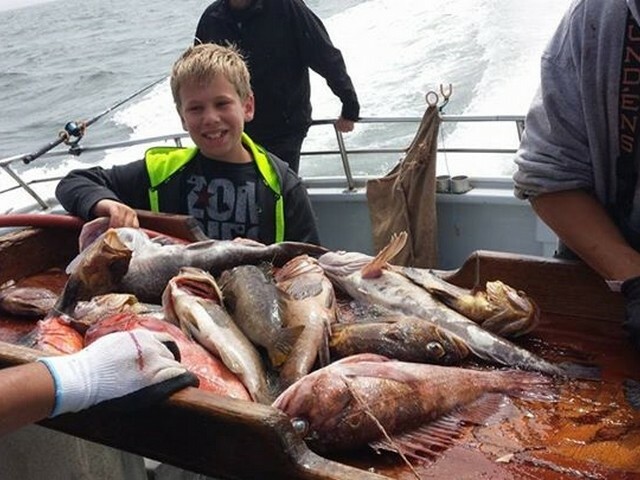 As the boys and their parents, accompanied by Sniffer Staffers Darren Butler and Sean O’Rourke, piled onto the 50-foot boat, excitement and anticipation were high. After a brief safety meeting, Captain Jon Yokomizo gave the order, and we were off. 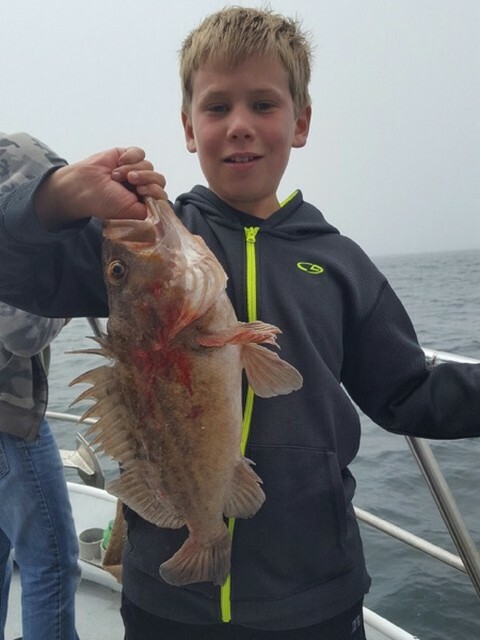 Jacob Ward caught his first lingcod of his young fishing career while fishing aboard the Sea Wolf. Last year, the fishing in the bay was excellent, so we didn’t venture out of the Golden Gate. This year, however, is different story. The striped bass bite had been inconsistent at best, and the bait remains scattered throughout the bay, making for tough fishing. Captain Jon suggested that we consider making the long run to the Farallon Islands. On any other day, I would have immediately jumped on the opportunity to head out there, but the decision is a bit more complicated with a boat full of 8-10 year old kids, many of whom have never been on a boat before, much less a 2 hour run on the open ocean. 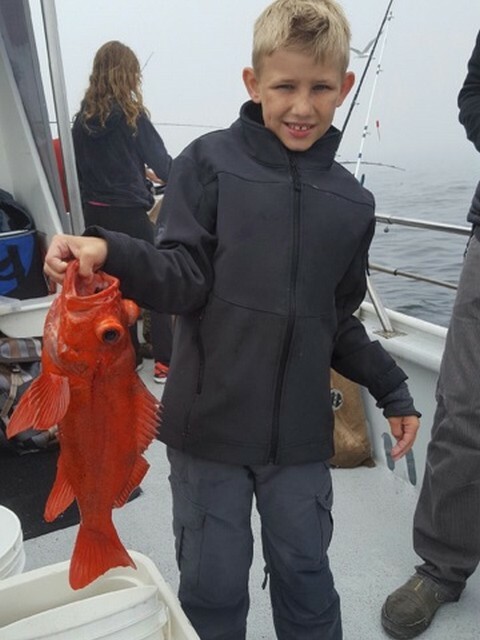 After a quick conference with a few of the parents, the prospect of putting the Scouts on big rockfish and solid lingcod action outweighed the risk of poor fishing in the bay, so we powered West out of the Golden Gate. Other than a lingering fog on upper reaches of the Golden Gate Bridge, it was a fantastic, sunny morning. The kids and their parents enjoyed the views of the city as we approached Alcatraz. While one of the parents pointed out the notable landmarks of San Francisco, the water began to swirl 50 yards off the boat as a whale surfaced right beside us. Everyone on the boat stared intently as its fluke rose and sank slowly into the water so close we could almost touch it. What a sight!. 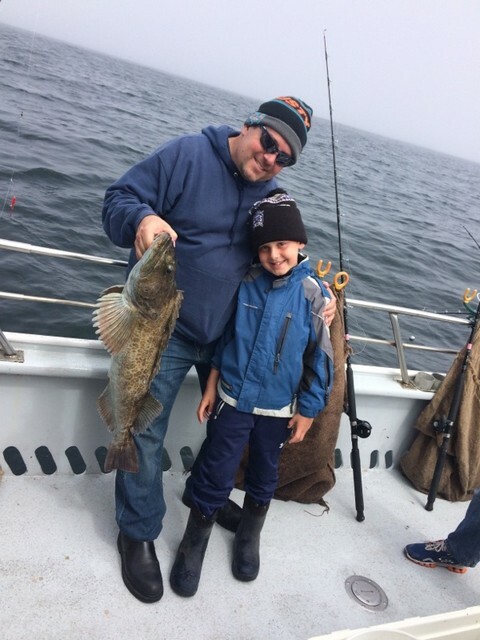 Kaden Cullen gets a hand from his dad Sean showing off the big Golden Gate lingcod he caught aboard the Sea Wolf. For the next hour or so, we were surrounded by whales. The lingering mist from their spray dotted the horizon for as we could see. Some of the elegant giants surfaced within two boat lengths of us as we made our way thru the Potato Patch towards the islands. The show was more than enough to keep everyone occupied on the long trip. Just about the time the boat began to echo, “Are we there yet?” and “When can we fish?” Captain Jon idled back the throttle in the distant shadow of the islands. Everyone took their places at the rail, baited their first of many sardines of the day, and prepared for the first drop. The ocean was absolute glass, even more so than the bay on a flat calm day. The order was given, “drop ‘em down,” and the lines descended to the bottom. 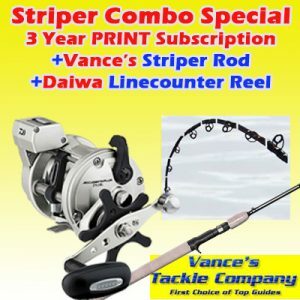 It only took a few bounces of the 3 oz lead for the rods to begin loading up around the rail of the boat. 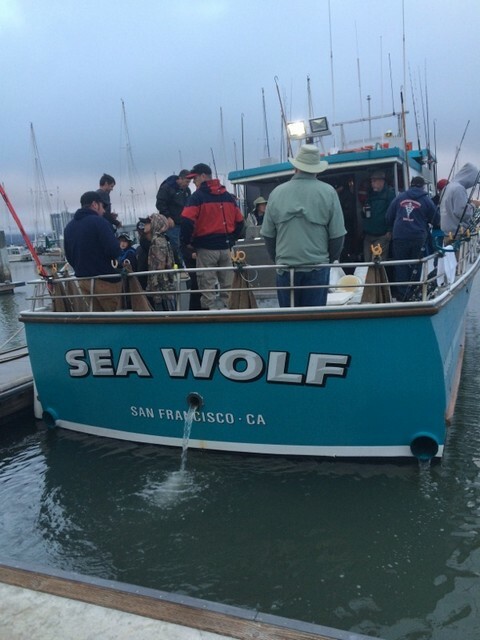 As the first few rock fish came to the surface, the Sea Wolf crew began hauling the catches onto the deck. I don’t know how to put the looks and expressions on the faces of the boys into words as everyone began filling their burlap bags with fish after fish. About half way thru the first drift, cries of excitement filled one side of the boat. The first lingcod hit the deck with a thud. 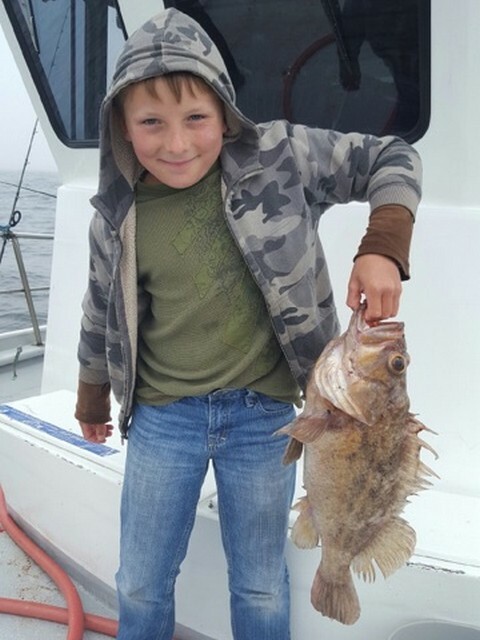 It wasn’t a huge fish as lingcod go, but to see something with that big of a head and all of those teeth measuring 2/3 the length of the angler reeling it up was definitely exciting for the kids. 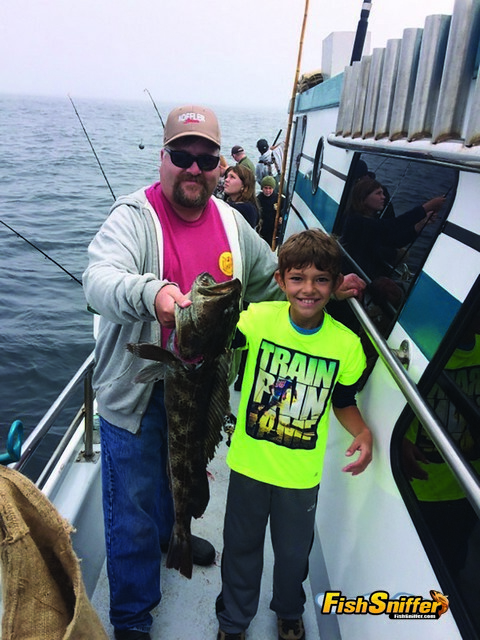 Lingcod quickly became the preferred species of the boys. Each one that came aboard sparked an instant debate of whose is bigger, which one fought more, and who had the biggest teeth. 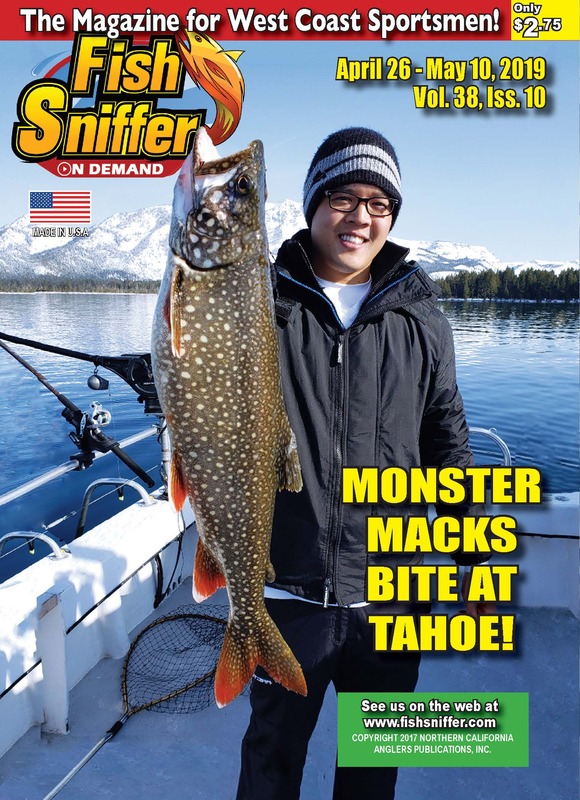 As we got into better quality lingcod, the intensity of the debate raged on. 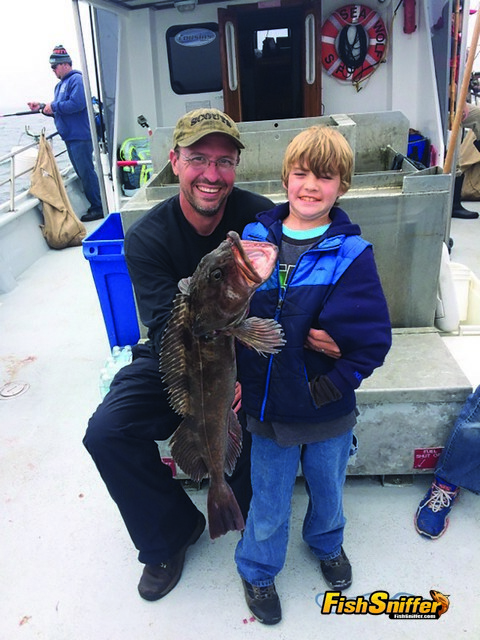 A solid mix of good-sized rock fish and lingcod were hauled aboard as we drifted about for the next few hours. Every once in a while, a new species would be caught including sea trout, soles, and even a snagged sea cucumber. The Scouts would gather around to examine and touch the various fish while asking an endless barrage of questions. 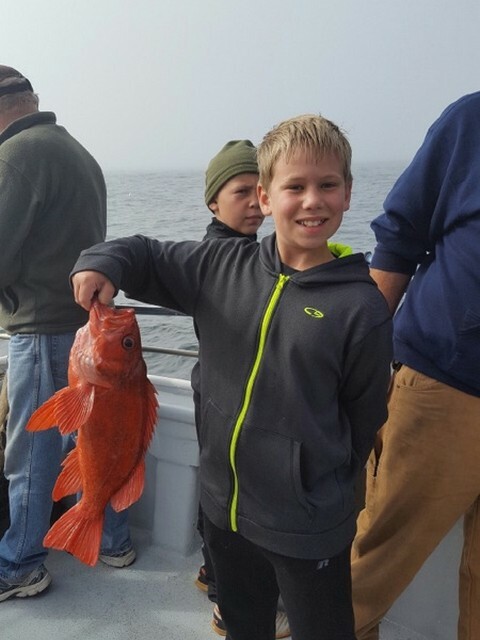 By early afternoon, the boat reached its limit of rockfish and was very close to limiting out on lingcod. The cabin of the boat filled with parents and kids exhausted and drained after a day of epic adventure looking for a place to crash for the ride inland. The crew set up the cleaning table and processed the catch as we motored east. A few of the kids watched as each fish was filleted, eager to see the contents of its stomach or the color of the meat. 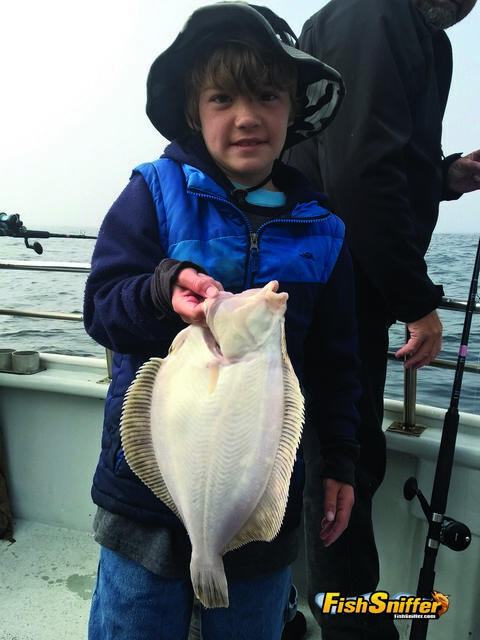 Jacob Ward shows off a handsome rocksole he caught while fishing about the Sea Wolf during the recent Cub Scout saltwater adventure. Whales continued to breach the surface occasionally as we approached the Bay. A very strong breeze blew from the North churning up white caps. Windsurfers dashed and darted among the boats occasionally catching air off the large waves. There was zero doubt that Captain Jon made the right decision to take the Scouts to the Farallons over playing it safe inland. As the haggard passengers exited the boat, bright eyes and huge smiles adorned everyone’s faces. The 2nd Annual Cub Scout Pack 215 Epic Fishing Adventure was not going to be soon forgotten by anyone. I have no idea how we are going to top this trip next year. A huge thanks goes out to Captain Jon Yokomizo and the awesome crew of the Sea Wolf. 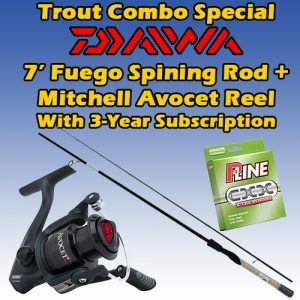 They always go out of their way to provide the absolute best experience on the water, even exceeding the expectations of a group of ornery kids. 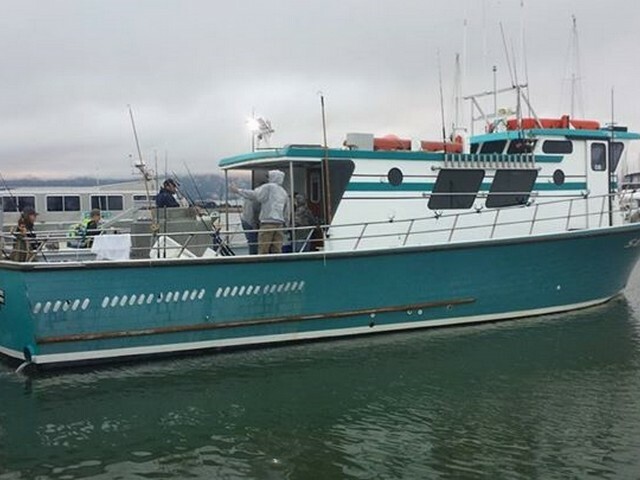 If you are interested in booking a trip aboard the Sea Wolf, you can contact them at (510) 604-0601 or visit seawolfsportfishing.com. Pack 215 also thanks Darren and Sean for all your help baiting hooks, tying leaders, untying tangles, unhooking fish, and everything else you did to make the experience for the Scouts. We hope you guys will join us next year.